We made Howard Dean wince! On Wednesday February 18, ex-Vermont governor Howard Dean abandoned his campaign for the U.S. presidency just weeks after being all but crowned as the presumptive Democratic nominee. On October 5, 2003, the day after the Great Midwest Marijuana Harvest Festival in Madison Wisconsin, me and my friend, New Jersey medical marijuana activist Jim Miller, husband of the late Cheryl Miller, an MS patient who passed away in June 2003, 32 years after diagnosis, attended a large Dean rally at the Kohl Center on the University of Wisconsin-Madison campus. News reports put the crowd at over 5,000. Dean, who blocked a medical marijuana bill as Vermont governor, had a position on medical marijuana that earned him a grade of "F" from a New Hampshire pro-medical marijuana group. From our position near the stage (Photo 1), Jim Miller called out a comment about medical marijuana and his late wife, and Dean stopped his speech to address it. 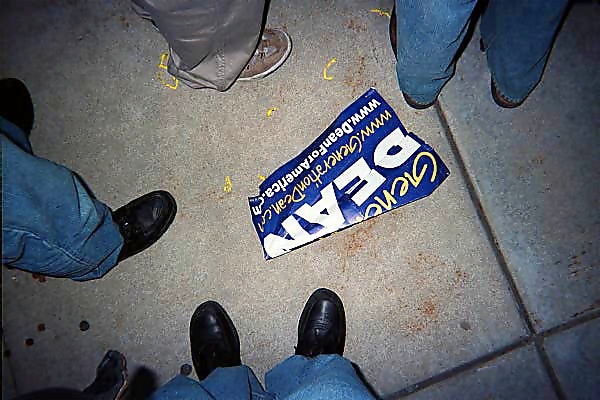 As Jim called out, young Dean campaign aides ran in front of us and held up Dean signs (Photo 2). Dean then went into his medical marijuana position that if elected, he would order the FDA to do a review of the literature. He said he expected that the FDA would probably approve medical marijuana for AIDS and cancer patients, but would find that for glaucoma, the risk would outweigh the benefits. I then called out to Dean that I was a glaucoma patient and had used cannabis for over 30 years, and it had saved my eyesight. At this comment, Dean visibly winced. 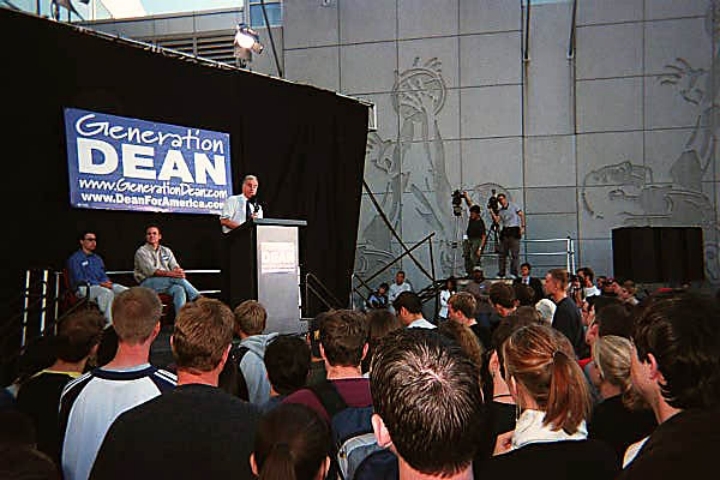 Today, the illusion that Dean was a progressive is finally ended along with his campaign. Below are some articles about Howard Dean in Wisconsin.